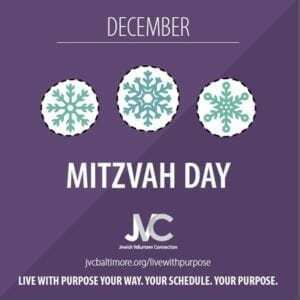 Join JVC and Live With Purpose by adding a personal touch to the Winter Care Packages that are distributed on Mitzvah Day (December 25th.) Volunteers will be decorating and writing supportive messages on cards that will be included in the packages. The cards are often the first thing that the recipient looks at and past recipients have expressed their gratitude for the personal touch. Who are we helping? The winter care packages will be delivered to clients of community shelters and soup kitchens throughout Baltimore city and county. In addition to the cards, the winter care packages will also include a hand-knit hat and scarf, food, and toiletries. Did you know? At least 3,500 people in Baltimore experience homelessness on any given night, totaling over 30,000 people/year. $18 for supplies for 50 Coloring Cards and Markers/Crayons. $18 for supplies for fifty Cards and Markers/Crayons. $36 for supplies for one-hundred Cards and Markers/Crayons.